Although tradition claims that clan Donnachie descends from the Macdonalds, the Robertsons probably descend from Crinan, Lord of Atholl and hereditary Lay Abbot of Dunkeld. From Crinan sprang the royal house of Duncan I, King of Scots. The Robertsons are more properly called Clan Donnachaidh, from Duncan, fifth in descent from Conan of Glenerochie. Duncan supported Robert the Bruce and his clan fought at Bannockburn. In 1437 the chief, Robert, arrested and delivered to the government Sir Robert Graham and the Master of Athole, two of James I 's murderers, for which he was rewarded with a crown charter, in 1451. His grandsons became progenitors of various families of Robertsons. William succeeded c. 1507 but arguing with the Earl of Athole was ultimately killed in 1530. The Earl seized nearly half of the family estate. Donald , 12th chief, was devoted to Charles I 's cause, the latter raised a regiment of his name and followers, fighting for the Marquis of Montrose, later commissioning him as colonel on the 10th of June 1646. The next chief, Alexander Robertson, had an academic life and passed into history as the ?poet chief.? After James VII ?s final defeat in 1690, the Robertson estates were forfeited and he was exiled to France. Allowed to return to Scotland under Queen Anne in 1703 he attained a remission and resided on his estates. The Robertsons fought with the "Old Pretender" in the rising of 1715 and the chief, Alexander, was twice captured by Government forces finally fled to France but returned to Scotland in 1725. However, he refused to take pledge allegiance to the house of Hanover. Despite this, he hastened to the side of Prince Charles Edward Stuart. A descendant of the line, Major-general George Duncan Robertson of Strowan, C.B., received the cross of the Imperial Austrian order of Leopold. His son and heir, George Duncan Robertson, (b. 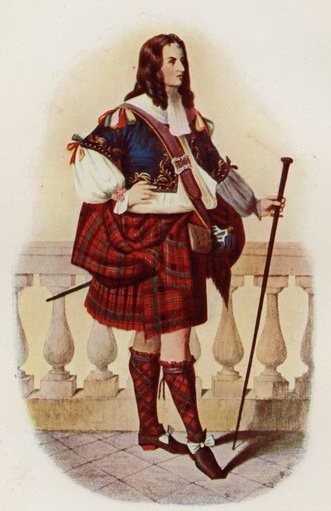 1816), was an officer in the 42nd Highlanders. The Robertsons of Lude are the oldest cadet family. Other families are the Robertsons of Inches, of Kindeace, of Auchleeks and of Kinlochmoidart. The chief of the clan is styled Struan - Robertson. A dexter hand holding an imperial crown, all proper.